Root canals are thought to be one of the most notorious dental procedures! Many people shudder at the mention of having one completed. With a reputation for discomfort, it’s not hard to see why a lot of patients shy away from endodontic treatment. But it can be easier than you thought! Find out how Dr. Sekhon can make your next endodontic appointment an effective and comfortable one. Gallery Dental is happy to provide in-house endodontic therapy (root canals) to our patients. We implement traditional endodontic methods as well as dental lasers and microscopes during the procedure. A root canal is a restoration that extends through the nerve chamber of your tooth. The open canal is filled and sealed off to prevent bacteria from entering into it and destroying the inside of the tooth. This restoration essentially replaces the nerve of your tooth. The result is that your tooth is no longer alive and should not have any more sensation. The entire outer portion of your tooth is still left to function as normal. Root canals are used on teeth that are no longer living. Once the nerve has suffered infection or trauma, the tooth will begin to disintegrate from the inside out. 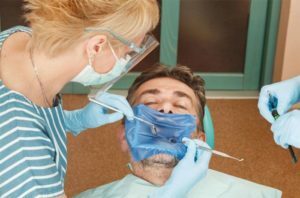 This procedure preserves the tooth so that it can be retained for several more years rather than needing to be extracted. We do our very best to keep you comfortable throughout your entire endodontic appointment. Our office uses lasers to ensure an accurate procedure, and oral sedation for relaxation. 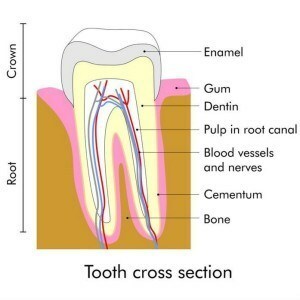 After your root canal treatment, we will place a crown over the tooth. Your tooth’s outer structure will be somewhat compromised after a root canal. The custom crown prevents the fragile tooth from breaking or wearing down even further. Are you suffering from a large cavity? Does extreme tooth sensitivity keep you from enjoying the foods you love? Is chewing painful? Do you have any strange tastes in your mouth? Such signs and more could all indicate a need for endodontic therapy. All treatment is provided by a general dentist. For more complex cases, we often refer our patients to a specialist for treatment. If you suspect that you need a root canal or are experiencing tooth pain, then call us here at Gallery Dental to schedule an individualized comprehensive exam with Dr. Sekhon today. If this is a dental emergency, call us right away for a priority appointment! Don’t let sleep apnea keep you awake at night. Learn about our sleep apnea treatment options.